The two most common porous implant materials include: hydroxyapatite and polyethylene. These substances are commonly wrapped in autologous (patient’s own) tissue or donor tissue and implanted into the orbit once the eye has been removed. The extraocular muscles are then attached to the tissue to provide normal motility to the implant. Once the tissue swelling resolves, the patient is fitted for a prosthetic eye. Patients who are referred for possible enucleation must undergo a complete eye examination. The unaffected eye is examined with the biomicroscope, visual acuity is measured, eye movement is evaluated and the posterior segment of the eye examined. The affected eye has a similar complete examination. Movement of the affected eye is important to evaluate because this can help in determining how much movement there will be of the prosthetic eye. In addition, it is important to evaluate the conjunctiva (transparent membrane that covers the surface of the eye). Patients with significant scarring of the conjunctiva may require a mucous membrane graft to allow coverage of the orbital implant. As with other surgery, patients are asked to arrive at the hospital 1-2 hours prior to surgery. It is not uncommon for patients to stay overnight in the hospital after surgery. This allows the nursing staff to draw appropriate lab work, start an IV and answer any further questions you may have. An anesthesiologist will discuss anesthesia prior to surgery and answer any questions you may have. Surgery lasts 1-2 hours after which time a large “fluff” dressing will be placed over the operated eye. The dressing is left on for several days. The postoperative care in the immediate few days after enucleation is centered around keeping the patient comfortable. Because the dressing is not removed for several days after surgery there is no wound care to be concerned with. 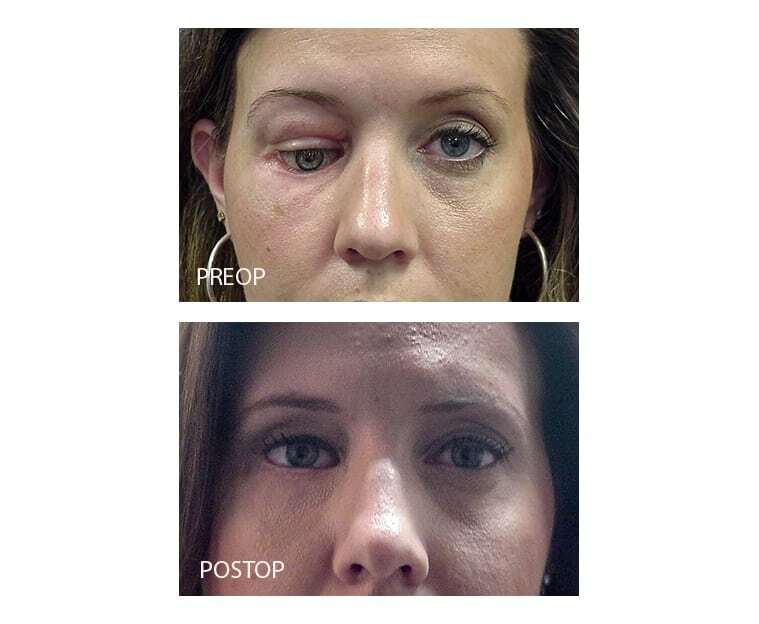 It is not uncommon for patients to experience significant pain after enucleation surgery. For this reason we commonly prescribe oral narcotics and anti-nausea medications. In addition, patients are started on oral antibiotic medication for one week after surgery. After the dressing is removed patients will be instructed to place an antibiotic ointment in their eye socket 2-3 times daily for several weeks. A conformer (plastic shell) will be placed under the eyelids after surgery to keep the eyelids from sticking to the underlying surface. Once the swelling in the conjunctiva has subsided in 6 to 8 weeks, patients are asked to see an ocularist for final fitting of their ocular prosthetic (“glass eye”). Enucleation surgery is very safe and only rarely do patients experience significant complications. Complications include but are not limited to the following: bleeding, infection, scarring, persistent swelling, pain, wound separation and the need for additional surgery.